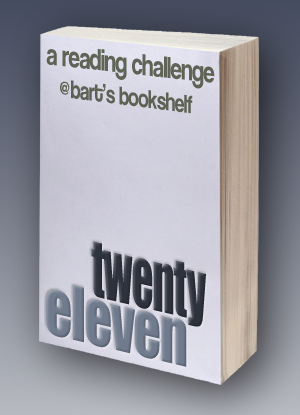 Bart's Bookshelf is hosting the 2011 TwentyEleven Challenge. The goal is to read a total of 20 books from 11 different categories. You must read a minimmum of one book and a maximum of two books per category, meaning you can choose two categories to read only one book. Click here to sign up! To YA or not YA…Okay, this one works like this… Tend to read more Young Adult than Adult Fiction books then read one or two adult fiction titles, vice-versa if you don’t tend to read much Young Adult. I read a pretty good mix, so I'm reading one of each. Hot off the Presses.Read a book published (in your country) in 2011? Then it counts for this category. It Wasn’t Me! (aka Bad Bloggers*)Books in this category, should be ones you’ve picked up purely on the recommendation of another blogger count for this category (any reviews you post should also link to the post that convinced you give the book ago). Back in the Day.Re-read an old favourite or two for this category.